This program is designed for ranked players who have achieved outstanding results throughout the years. Players who have won national or regional tournaments and/or in the Top 5 of their age-group. Scholarships will be offered to the elite players. This program is for players who are aspired to achieve better tournament results. It is the stepping stone to the Elite Program. This is the next step for our improved beginner players. In this program, our players will discover their potential for tennis. 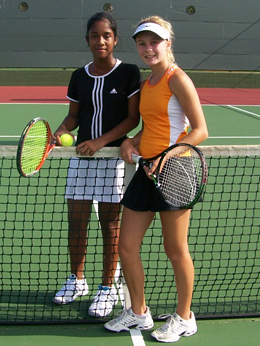 Beginner: This program will teach and improve the basic fundamental skills required for tennis. Players will be introduced to the game of tennis through variety of coordination exercises and games. This program has been specially designed by our experienced coaches to introduce tennis to young children aged 3 - 6. This program has been proven to enhance cognitive, mental and motor skill development of young children. Start early and your child will benefit in all aspects of his/her development. All our coaches are available for private coaching. 30 days advanced booking is recommended. For more information, please contact us.